Regular dental hygiene is not only important for the sake of your smile, but for your overall health, too. Yes, teeth allow you show the world you’re happy, but they also serve important functions such as their role in digestion. With proper oral hygiene, your teeth can last a lifetime. Read on to learn from the dentist in Ocala about the value of taking good care of your teeth and gums. There are millions of bacteria living in your mouth. These bacteria feed off of the sugars in foods you eat and then they excrete acids. If not regularly cleaned away, these acids begin to erode your tooth’s protective layer of enamel. Eventually, dentin—the layer below enamel—is exposed and a cavity results. The daily oral hygiene you perform with regular brushing and flossing, as well as your dental checkups with the dentist, helps prevent tooth decay, or cavities. When a cavity is present, a family dentist in Ocala may be able to repair the damage with a tooth-colored filling. In the case of an especially large cavity, a dental crown may be necessary. And if decay reaches a tooth’s pulp chamber, then root canal therapy removes the bacterial infection and preserves the tooth. Brushing removes particles of food and plaque from the chewing, facial and lingual surfaces of your teeth. But how do you remove debris from in between teeth? For that you need to floss. Flossing is essential for removing plaque, which is a biofilm that hides bacteria. Left in place, plaque begins to build up along your gum line, leaving soft tissue around your teeth vulnerable to attack by bacteria. Eventually, gum disease develops. The initial phase is called gingivitis and is marked by gum tissue that bleeds and may look red and swollen. Others may notice that your breath smells bad, too. Gingivitis can be reversed with stringent oral hygiene care at home and a professional cleaning at the dentist in Ocala. If plaque is not removed and gingivitis is allowed to progress, then periodontitis can develop. This more advanced bacterial infection may require deep cleaning below the gum line, laser therapy or surgery. Gum disease has also been linked to heart disease, stroke and diabetes. So when you take care of your oral health, you also take care of your body. Don’t ignore your teeth and gums. 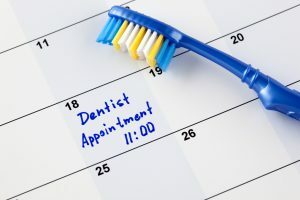 Brush and floss every day, and be sure to schedule regular dental checkups. Throughout his years of experience in dentistry, Dr. Daniel Weldon has helped countless patients address their oral health problems and realize their smile’s true potential. If you have questions or concerns about the condition of your teeth and gums, please contact our office at 352-509-5761.